Which is the best travel guide to buy and can I buy Dirhams before I travel? Do I need a VISA to travel to Marrakech? What happens if my passport is lost? How far is the airport from the Riads and how do I get there? What temperatures can I expect when I am going to Marrakech? Can I use my mobile phone in Marrakech? How do I get around the Medina? Can I get alcohol in Marrakech? and where can I smoke? Can I have a friend stay over in a Riad in Marrakech? Is it safe to walk around alone at night? Is the food spicy and is it safe to eat at the food stalls? What is the convention regarding tipping? Are there pharmacies in Marrakech, Morocco? What is the electrical voltage in Marrakech, what type of plugs do they have, and what appliances will be provided in my room? When can we check in to the Riad? What time must we vacate the room when checking out after our exclusive stay in Marrakech? Our unique smartphone App the Marrakech Riad Travel Guide is free to download and helps you navigate the souks without needing wifi or data roaming. We really like the Lonely Planet Marrakech Encounter guide but there are many excellent guides to choose from, why not browse our online store. The Dirham is not allowed to be taken out of the country in amounts larger than Dirhams 1,000 consequently it cannot be purchased before traveling. A bureau de change is available at Marrakech airport and there are ATM machines both at the airport and in the City. Scottish notes are not accepted in banks in Morocco and many banks are uncomfortable accepting travelers cheques. Suggestion: Ask for some small notes or coins when exchanging money. Tips are customary in Marrakech and many everyday items cost much less than a 100 dirham note. Top tip: Bear in mind Marrakech has largely a ‘cash economy’. Credit cards are not widely accepted except in top restaurants and antique shops. Good news if you are planning for exotic last minute holidays. Citizens of EU countries, including Britain, do not need a VISA for tourist visits of up to three months. There is however a requirement for passports to be valid for three months at the date of entry. We are fortunate to have an Honorary British Consulate in Marrakesh which can help with a replacement passport or papers to allow British Citizens to return home. 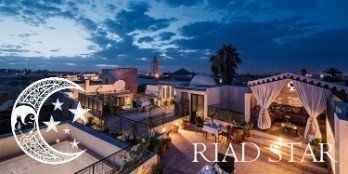 Marrakech Riad Papillon and Marrakech Riad Cinnamon are both accessed through the well known Dar El Bashah entrance to the Medina, our Riad Dar Habiba is accessed through the Riad Zitoun entrance, and our Riad Star is accessed through the Place Mokkef or Dior Sabbon entrances. The Medina is about 15 minutes drive from the airport. We strongly recommend that arriving guests use our airport transfer service priced at £15 pounds each way for two people booked in advance. Our driver will meet you at airport arrivals and you will be accompanied all the way to the Riad. From June to August temperatures are often in excess of 40 degrees and can reach the high 40’s. December, January and February can see sunbathing weather in the day up to 27 degrees with nights as cool as 8 degrees. Spring and Autumn are the traditional high season times to visit Marrakech with temperatures in the high 20’s to mid 30’s. Suggestion: the dipping pools at Marrakech Riad Papillon , Marrakech Riad Cinnamon , Marrakech Dar Habiba and Marrakech Riad Star are excellent for cooling off during warm weather in Morocco! Morocco has an excellent modern mobile phone infrastructure which also supports 4G and data roaming. However it is advisable to check charges with your mobile provider before using your phone extensively to avoid unpleasant surprises. Suggestion: Marrakech Riad Papillon, Marrakech Riad Dar Habiba, Marrakech Riad Cinnamon and Marrakech Riad Star all have local pay as you go mobiles which can be loaned to guests and are excellent for local calls. Top ups are 50 or 100 Dirhams available from kiosks across the medina or the Riad staff will be happy to help. 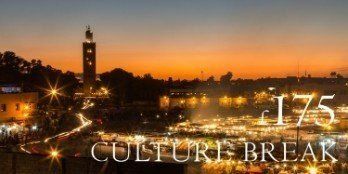 Your Marrakech Riad can organise a tour by horse and carriage, known locally as ‘Caleche’, this is an excellent way to visit the palaces and gardens. Suggestion: An accurate map of the Medina is hard to find, one of its charms is the intricate network of interconnecting streets and alleyways. Many first time visitors find a compass helpful. In our view by far the best map of the medina is the Rough Guide Map, why not buy a copy before you travel from our Marrakech Riad Online Store. Suggestion: We recently published the Marrakech Riad Travel Guide, a smartphone App which is free to download in the Appstore and Googleplay. This includes a Map and Guide with offline GPS positioning, meaning that you do not need wifi or data roaming enabled to establish you approximate position in the Medina. Suggestion: The roof terraces at Riad Papillon, Riad Dar Habiba, Riad Cinnamon and Riad Star are private spaces that are perfect for sunbathing. The Medina does not have pubs or wine bars, however there are plenty of hotels and restaurants with public bars. Alcohol is not available in the cafes around the place Jemaa al Fna. In the new town of Guiliez there are several European style bars as well as a vibrant night club scene. A number of the fashionable cafes in Guiliez serve alcohol indoors, including the Grande Café de La Poste, and where this is the case the logo of a beer brand is often displayed discreetly outside. Local Café bars on the backstreets in Guiliz are basic and inexpensive but these are pretty much male only and are not recommended for female visitors. Suggestion: local Moroccan wines can be excellent and are much less expensive than those imported from France. It is forbidden by law for resident Moroccans to stay over in a licensed Maison d’Hote with a non Moroccan. The Medina of Marrakech is probably safer than a European City. There is a specialist Tourist Brigade police force whose duty it is to protect foreign visitors. The locals regularly drink the tap water but visiting tourists will not have time to get used to it and are probably best to drink bottled water. Mineral water can be purchased from many kiosks and stalls around the Medina and chilled water is available at a small charge from the mini-bars in the rooms at Marrakech Riad Papillon, Marrakech Riad Cinnamon and Marrakech Riad Star. Traditional Moroccan cuisine uses fragrant spices like cinnamon rather than hot spices. 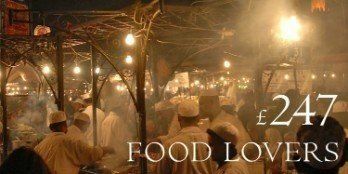 Food stalls, including those in the Jema al Fnaa, often do not have running water or refrigeration so they are not able to properly wash plates and food hygiene can fall well below Western standards. It would therefore never be strictly speaking ‘advisable’ to eat at food stalls when considering where to eat in Marrakech. However, many visitors have eaten without problems and the atmosphere in the square is an exceptional experience. There is an argument that at least the cooking is visible unlike many inexpensive restaurants. All would agree that it is particularly important to keep to items that have been well cooked when eating meat. We would not reward poor or bad service with a tip and on occasion we have put up with a bit of personal embarrassment to make that point. On the other hand Morocco is a developing country with minimal state provision for those in real need. There are many large families with only one or two bread-winners working, yet even so there is remarkable solidarity and a strong culture of sharing with others in the community. In this context we feel very good about giving generous tips to everyday working people. Cafes: It is polite to leave two or three dirhams if you are having a coffee or soft drink. Giving Euro coins, sterling coins or small US$ bills is not ideal. The waiter will not be able to spend foreign change in local shops and it will probably end up in the hands of boys in the street hassling tourists to change it for Dirhams! Restaurants: Similar to the UK, 5-10% is considered appropriate or generous. Of course it’s fine to give more if the service has been really exceptional. Small or ‘petit’ taxis: can take up to three passengers. For five or ten minute journeys around the old town or to nearby Guiliez the drivers often do not put on the meter, there is no need to worry about this. It is polite to give 15 or 20 dirhams (the meter would probably go to less than 10) if the driver demands more walk away with confidence you have been fair with him. For longer journeys ask them to put the meter on and round up to the nearest 10 dirhams. 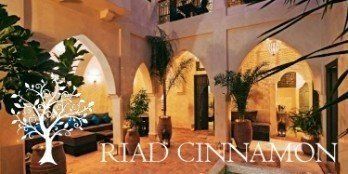 Whole Riad Parties: For larger groups we suggest it might be helpful for the group organiser to coordinate any gratuities at the end of your holiday. In the case of whole Riad bookings 5 % of total bill including accommodation is considered generous. The voltage is 210 as in the UK and they use a standard European two round pin plug. The Riad staff will be happy to provide UK adaptors if you need them. 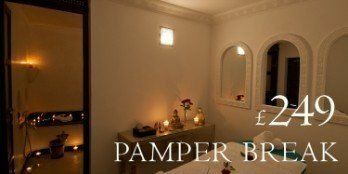 Our luxury rooms have air conditioning, flat screen tv’s with satellite channels, minibars, and hair dryers. We do not provide an iron because there there are no surfaces in the rooms suitable for ironing. There are a number of excellent dry cleaners and ‘blanchisserie’ in Marrakech offering ironing services with a quick turnaround. Check in time at our boutique hotels in Marrakech is 3pm. Where the rooms is available and prepared we will be pleased to let guests check in early at no extra charge. If possible please advise in advance of any late arrival. Riads are essentially luxury family homes built in an intimate courtyard setting. So as not to disturb guests who may be sleeping we prefer new arrivals to check in before 10 pm. Check out time is 11.00 on your departure day. Arrangements may be made for a later check out if the room has a late arrival, you would need to check with the Riad the night before. We do not charge for late check outs. In any event we will be pleased to look after you and your baggage until you are ready to leave for the airport. Take a look at our fantastic accommodation before making your Marrakech reservation!